Do you have to manage an international team, or perhaps work within one yourself and are concerned about liaising with everyone effectively in spite of different time zones? You need look no further. Created by the leading clock maker, Hermle, the Hermle Buffalo II World Time Clock will perfectly suit your needs. 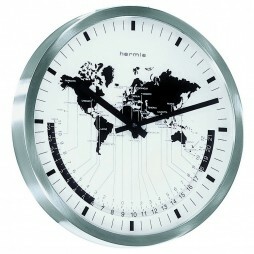 Featuring a nickel plated case on a stand, its world map in black is immediately noticeable against the white clock face. Each time zone also has lines connecting it to numerals on the face making it much more convenient for you to match a time to them. In this day and age when it is possible to instantly connect with anyone anywhere on the globe, there is no greater convenience than a clock that lets you know what time it is just about anywhere else. And that is what makes the Hermle Buffalo I World Time Clock a must have for anyone who needs to manage international schedules flawlessly and at the drop of a hat. Brought to you in a nickel plated case, this clock?s main feature is the world map that stands out against the white background of its face in addition to its hands and numerical indicators which are also in black. 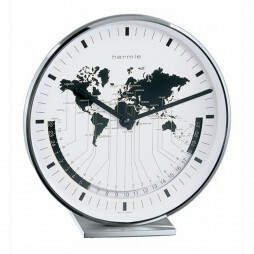 The Hermle Airport Time Zone Wall Clock is the ideal accessory for any formal setting. Its conventional, yet stylish design makes it a perfect choice for the modern office or conference room. Its neutral colours of chrome, black and white also ensure that it will blend in with any colour scheme, while its world map motif against a contrasting background will enable it to stand out at the same time. 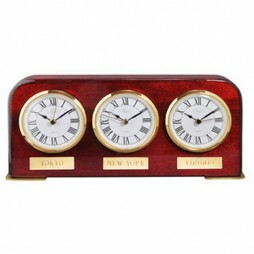 This unusual grouping of clocks create a stunning piece of home dcor you will love to have in your home. This wall clock has a stunning visual appearance and has beautiful unique features. This wall clock was made of hand forged metal. It also has a dark chestnut, brown, heavily antique gold and sliver finish. It also has burnished details. This clock also has quartz, battery operated movement. Capture the creativity of Grace Feyock with this eccentric wall clock. 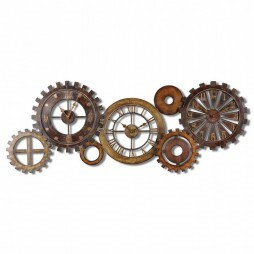 This clock will pair well with the industrial or rustic interior. Tell time from three different time zones with this eccentric collage of clocks. This clock is a functional piece of art with stunning features you will love. This is an authentic and beautiful timepiece by Uttermost. This clock displays three different time zones. This unique collage of clock is made from hand forged metal. It also has a vibrant rustic red, antiqued gold and aged black finish. This decorative wall clock also has quartz, battery operated movements. Capture the artistic vision of Grace Feyock when you buy this clock. Its stunning artistic features will add an excentric touch to your home or office. For someone who’s in love with the idea of world travel, this is a perfect piece of inspiration to own. The Time Zones Wall Clock has a phenomenal quart movement. It includes 5 dials that display names of 37 cities and blank brass plates. Crafted from Alder wood, this seraphic timepiece is an impressive accent for all sorts of decor themes, be it traditional or contemporary. For that classic wayfarer vibe, get this one for your home today! So maybe you’re a world traveler and you need various time zone information at your disposal constantly. Or perhaps you simply communicate daily with others around the globe. Whatever the reason, a time zone clock would benefit you well. Here at ClockShops.com, we offer world time clocks for sale that are both highly functional and stylish enough to fit right into your current decor. Time zone clocks are indeed one of the finest options for keeping track of time, in any country. Besides bringing an element of fashionable design, they also provide necessary information that will keep you organized and on track. The greatest advantage of world time clocks is, naturally, their ability to announce the time in multiple locations. Imagine all of those stressful situations you’ve come across lately. How about when you’ve wanted to call a friend or family member on vacation across the country, but didn’t know if it was day or night? Or when you need to speak with business associates who live across the world, yet you have no idea what schedule they’re on? Finding the perfect time to contact people can be tricky. You don’t want to continuously miss a deadline, or upset whoever you’re trying to speak to by calling at an inconvenient time. They may be asleep, may be in a important business meeting; the possibilities are endless. Let a time zone clock take the worry and stress away. Our wide selection of world time clocks for sale will give you everything you need and more to stay connected during the right times. Expressions of Time makes it easier than ever to pick your favorite clock. Choose from various colors, sizes and styles that you’ll be happy to display in your home or office. Find yourself a timepiece that’s sophisticated and stately, like the Chass Grand Admiral World Time Chest Clock. The nautical design gives this piece a professional look, which is even more accentuated by the mahogany piano wood finish. And its base in a sleek, boxed frame makes this world time clock an ideal choice for a corporate gift. 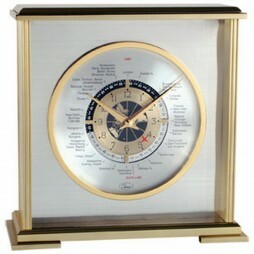 Upgrade your lackluster desk motif with a Howard Miller Discoverer TIme Zone Clock. 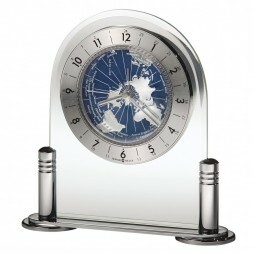 Sure to be a crowd pleaser, this world time clock for sale shows a revolving world map that informs you of any time zone, in a glass enclosed frame that’s sleek and modern. Feel yourself get lost in the deep blue ocean color and silver continents in the background image, which gives this time zone clock true shelf appeal. Or emphasize your love of travel with the Aviator World Time Clock. You can’t go wrong with a clock dial that shares over 25 times zones! And the dual gold and silver color scheme and airplane replica for the second hand make this time zone clock a centerpiece of any desk or table it rests on. No matter which model you decide to go for, our varied world time clocks for sale will leave you happy with your purchase. Why have a smaller version of a time zone clock on your desk, when you have an empty wall with space to fill? Give yourself more luxury with a world time clock for your wall! 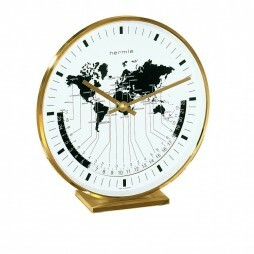 We have a lovely array of time zone wall clocks, such as the Rhythm Around the World II Multi-Time Zone Wall Clock. This oversized clock can pass for a simple yet professional print of a world map, which would look great as wall art all on its own. But you’re in luck! It also has multiple time zones, showcasing an elegant timepiece that’s also reliably functional. Fit this design with its classic, espresso wooden frame into any decor choices already in your home or office. Looking for something flashy and trend-setting? This next world time clock for sale, the Uttermost Rusty Movements Wall Clock, is the option for you! 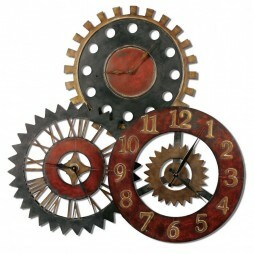 This amazingly abstract collage of three clocks is created with hand-forged metal, featuring finishes in vibrant rustic red, antiqued gold and aged black. Looking like a collection of gears straight out of a steampunk decor catalogue, you’ll never get bored with this fascinating world time clock for your wall. If the last choice was a little too outlandish for your tastes, try for something more formal, such as the Hermle Airport Time Zone Wall Clock. Ideal for more professional settings, like conference rooms, offices, etc., this timepiece conventional without losing any modern finesse. The chrome, black and white color scheme allows for placement in any room, all neutral base colors that blend into any decor. But the dark world map image still brings a pop of drama to this time zone clock, making sure it visually doesn’t fall off anyone’s radar. 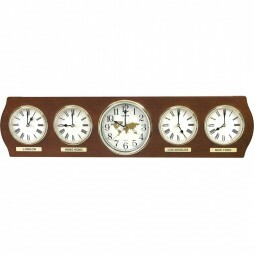 Here at ClockShops.com, we have world time clocks for your wall to match anyone’s personality. So get to shopping, and find the time zone clock that’s perfect for your space! We understand that trusting the craftsmanship of products on the market today can be dicey. It’s become especially true in our age of the Internet, where various side vendors and scam artists intent on selling faulty merchandise is hard to decipher from the real thing. 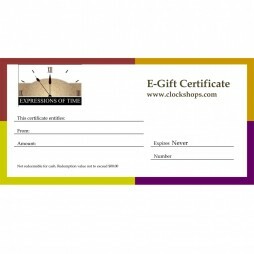 ClockShops.com is dedicated to only selling the best products to our customers. 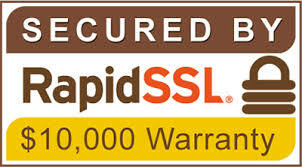 We acquire dependable timepieces from expert clockmakers and big name, reliable brands. You never have to worry about the quality of your purchase. Our expert team at Expressions of Time have years of experience in the field, and are happy to answer and and all questions or inquiries you may have regarding our merchandise. So browse through ClockShops.com today, and take home a timepiece you’ll truly adore.